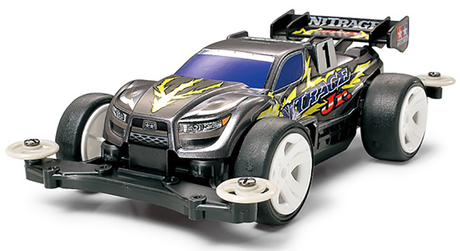 Jr.s unique truggy body and large rear wing are sure to turn heads at any track. Features the new N-02 nose unit. Eye-catching truggy body can be easily mounted on other MS chassis. Large dish wheels and 16mm rollers help provide stable high-speed performance. 4:1 gear ratio matched with the included Type 130 motor. No glue/cement required for easy assembly. Requires two R6/AA/UM3 alkaline batteries (sold separately).